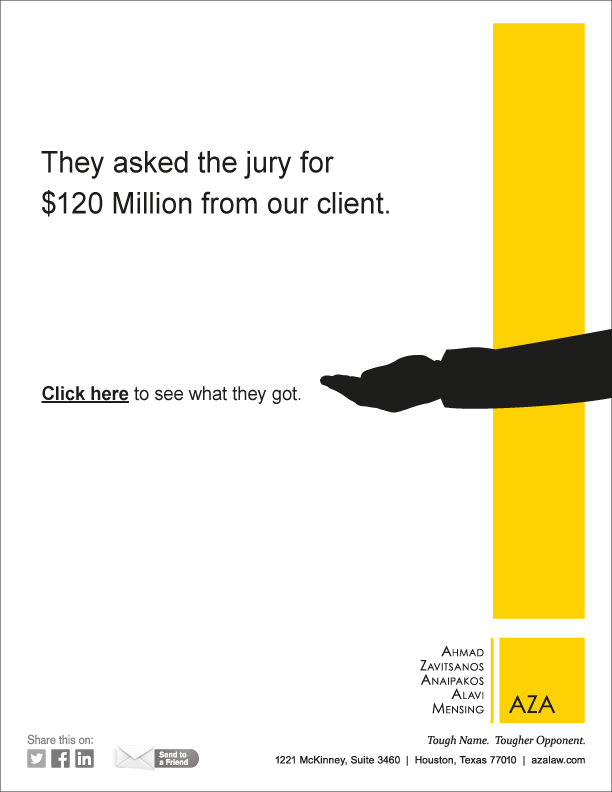 AZA is first and foremost a trial firm. Our nearly 50 lawyers have been in a trial roughly every month since 2016, despite courthouse closures because of Hurricane Harvey. We tried 15 cases in 2018. Our courtroom experience, our knowledge of what will matter to a jury or judge, and our command of trial technology permit us to do this efficiently. Being trial-ready also strongly influences settlement. Opponents recognize that with more than 225 trials under our belts, we have confidence in our position and our ability to advocate that position. In fact, AZA is often hired on the eve of trial, once it has become clear that the case must be tried. Although many of our cases involve high-stakes litigation for multinational companies, we also excel at representing individuals and mid-sized businesses with serious legal issues. We also understand that a superior result does not always involve a verdict or judgment, and are equally skilled at developing creative solutions to business problems. AZA also manages company investigations. We help company boards, in-house counsel, and audit committees identify problems and ensure compliance before litigation ensues.